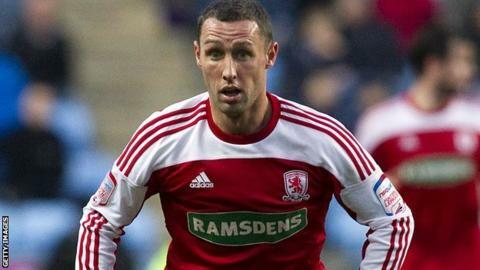 Scott McDonald scored a late winner for Middlesbrough as they beat 10-man Watford at Vicarage Road. The home side took the lead when an Andre Bikey error led to Matej Vydra's shot being parried and Troy Deeney pounced to score from close range. Marvin Emnes equalised with a close-range effort before Vydra was sent off for an apparent stamp on Nicky Bailey. Middlesbrough eventually made their numerical advantage count when McDonald scored from 12 yards for the winner. Watford have picked up only four of their 13 points at Vicarage Road. Australian McDonald had as he had not figured in the senior set up. He came on as a 39th-minute substitute for Justin Hoyte and marked his return with a goal which gave Boro their first win in three matches. Watford had made an ideal start when Vydra, who intercepted a short backpass from Bikey, had his shot saved by Jason Steele before Deeney scored. The Hornets failed to make the most of their dominance and were punished by Emnes equalising for Boro. The home side suffered a further setback with Vydra's red card and, after Bikey missed the target with a six-yard header, McDonald struck for the decisive goal. "Unfortunately in four days we had two games and in both games we end up with 10 players, and I don't think we deserve that and especially today because my team was playing very good football and created a lot of chances. "We allowed them to come back for a while because Middlesbrough is a good team and they scored. "But we thought we still had the game in control. After that episode it was another story." "It [the red card] was obviously harsh for them. They started the game extremely well with their shape 3-5-2, I thought we were getting to grips with the game. "The sending off obviously helped us and allowed us to have the ball. "We still found it difficult to break them down but eventually got the second goal and saw the game out."